Cottages & Suites (1 to 3 bedrooms) on the ocean in the heart of Islamorada... minutes from the best dining, shopping and fishing in the Keys and just 80 miles south of the Miami airport! One of the few resorts awarded the special "Superior Florida Keys Lodging" designation... your assurance of quality and cleanliness. Also awarded the "Beautification Award" from the Islamorada Chamber of Commerce. You will appreciate our attention to detail. All rooms come with fully equipped kitchens, living area (some with sofa-sleepers) and patio or balcony, most with ocean views. Our heated freshwater swimming pool is just inches off the Atlantic and if you bring a boat, we provide free dockage and ramp for boats up to 32 feet. Please call for details; size of boat allowed depends on draft. The Oceanfront Cottage Style rooms are the most popular. Right on the water, you'll have an excellent view with direct access to the beach, pool and docks. Let the tropical breezes and swaying coconut palms ease you into the slower pace of island life... it's the perfect spot to unwind. These are recommended for just two people but if you bring the little ones, some have a pull-out sofa bed. Maximum capacity is 4. Each has a fully equipped kitchen stocked with just the right tools you'll need (including a coffee maker and coffee). Our oceanview 1-bedroom suites are situated in the middle of the property but still offer a nice elevated tropical view from the balcony. Each has your choice of a king or a queen/single bed combination in the bedroom. There is a pull-out sofa bed (recommended for children only) in the living room if you need a bit more space. There's a full kitchen with breakfast bar, coffee maker, a full bath, closet, balcony and covered parking below. Maximum sleeping capacity is 4 with the king bed and 5 with the queen/single bed option. If you want the finest in private, luxury accommodations... if you want peace & quiet in a tropical setting... Welcome to The Orchid Cottage! This one-bedroom, private cottage overlooks the crystal waters of the Atlantic Ocean. Everything is new with top of the line everything. 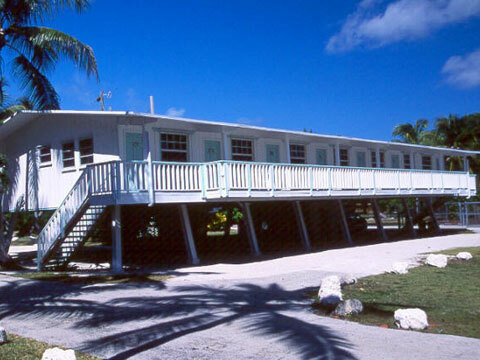 Enter by your own private driveway, walk to Islamorada's finest restaurants. Dock your boat in the deep water basin. Enjoy soothing tropical breezes on the beach. You'll see right away... this is special. Features Include: Finest quality furnishings Ceramic tile floors Screened patio with wicker furniture 32" TV with DVD, VCR & Stereo Central A/C Ceiling fans Full kitchen with dishwasher, garbage disposal, microwave, coffee maker, ice machine, dishes, cooking equipment... everything you need Washer & dryer Iron & ironing board Bicycles BBQ included Pines and Palms swimming pool Wireless Internet King size bed with best quality linens. Extra large fluffy bath towels Queen size sofa-bed in the living room Tile shower, super water pressure Plenty of closet space Boat basin Orchids & tropical plants inside and ou Our Bonefish & Tarpon Villas have 2-bedrooms with 2 1/2 baths and are available weekly or monthly. They're right on the water and come fully equipped with everything you need to enjoy a relaxing vacation in Islamorada. King Beds in each bedroom Full Kitchen with Dishwasher Washer & Dryer Central Air Jacuzzi Tub in the master suite Covered carport with lockable storage Free dockage Maximum capacity of six persons Minimum stay & security deposit required. Weekly rates are $399 to $579 per night depending on dates. Our oceanfront heated freshwater pool is inches from the Atlantic's edge providing the ultimate view as you soak up the sunshine. If you would like to swim in the ocean, go on a snorkeling adventure, wade for Bonefish or just look for sea horses and shells... we provide swim ladders on both of our 125 foot docks. Bring a boat or rent a boat... we provide free reserved dockage and ramp for boats up to 26 feet (depending on specific boat). Fishing is a must if you stay in Islamorada... "the Sportfishing Capital of the World." You can catch a variety of fish right from the dock, but we recommend a trip with a local guide. From party boats to backcountry to deep sea fishing, we'll direct you to friendly professional guides that fit your budget and expectations. Kayaking is a wonderful way to experience the beauty and tranquility of the Florida Keys. Look for Stingrays, Bonefish, tropical fish and coral formations. You'll see Pelicans, White Herons, Cormorants, Egrets and Terns. If you're lucky you might even spot a dolphin or sea turtle. We offer single and double kayaks you can launch from the beach. Take it easy... read a book in the ocean front hammock or relax on the end of the dock.